Quality system - Reginox: the crown on your kitchen! Reginox endeavours to make sure that all its products and processes continue to satisfy the highest possible criteria. Therefore, we continually assess, modify and improve our products, processes, and customer satisfaction levels. To achieve this our company operates a Total Quality Management System in compliance with NEN-EN ISO 9001. 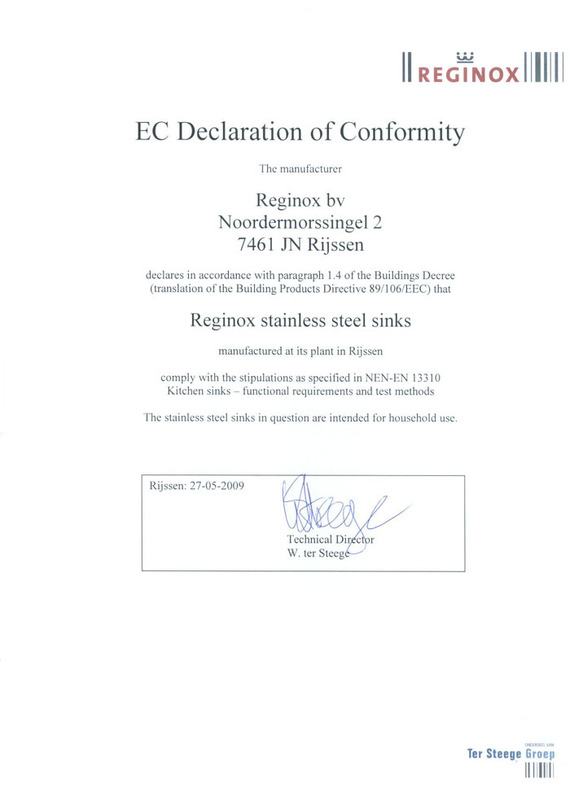 Since July 1996, Reginox bv Nederland in Rijssen has held Lloyds certification for designing and manufacturing stainless steel sink units and worktops, manufacturing plastic worktops, and supplying plastic worktops, granite sink units and accessories. Download EG Declaration of Conformity.